Which means the selection of fruit is getting a little smaller, berries are getting more expensive, and persimmons are here! I do love persimmons and I’m happy to have them for a couple of months. Yay, persimmons! Do you have anything tasty that you do with persimmons? I just eat them raw, and sometimes drip some lemon juice on them for a nice sweet and sour taste. I like them crunchy and I like them soft and ripe (although it’s impossible to get them home in one piece when they’re like that). I haven’t been getting out much to try out restaurants, as I can’t afford to at the moment, but I’m looking for some new recipes to try and share. I’ve got a lot on my plate right now, so to speak. I finished with a month of daily French classes, and am now focusing on writing music, working on websites, and brushing up on photography. Oh, and learning burlesque. One thing I can share is a recent event I attended on Friday night…. 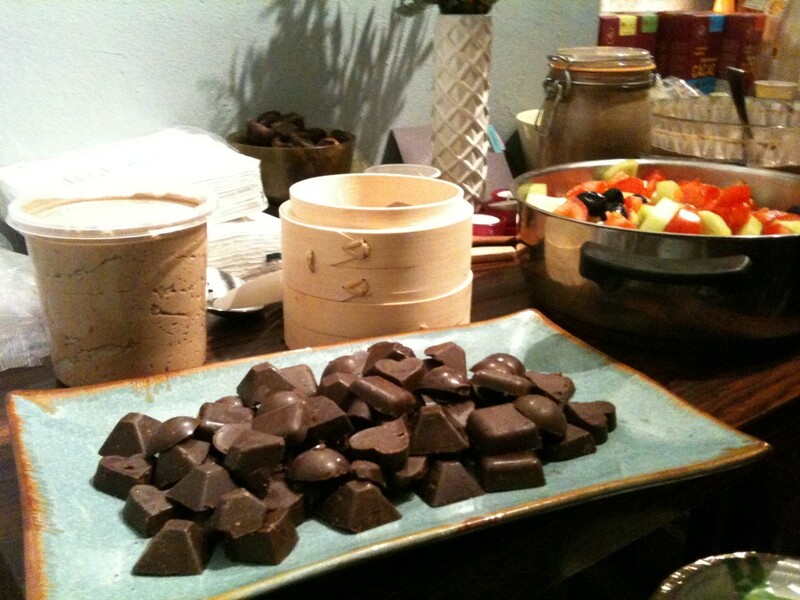 a raw chocolate party! I was brought there not knowing what to expect, it was kind of a little surprise treat for me on my last day of French class. I’m actually not quite sure who hosted the event, but one of the hosts was from California and the other from Brazil, I believe. We had chocolate in every form you can imagine. Raw chocolate virgins got initiated by eating a raw cacao bean, and then came the treats. One was quite fudgey, and I enjoyed that. Then there was the liquid chocolate. One was sort of a super drink that included spirulina, and another was chocolate-banana. I was pretty chocolated out at the end of the night! Well, that’s the update for now! There’s a new vegan hot dog and burger place in town, and I look forward to telling you about it very soon….